Methane is actually an excellent kind of fuel and there is about 35-40KJ/g chlorific value of Biogas. Fixed and Floating gases are the two commonly used biogas plants within India. The floating gas is the holder type plants, which have been also prepared by the Khadi and Village Industries Commission or the KVIC and used wherein the biogas is taken from the animal dung. It actually consists of a dome like structure, which is made up of steel floating up when the pressure of the biogas evolution increased. On the other hand, the fixed- done type structure has its longer life. Its dome could be made up from bricks. So, the cost of the plant would be reduced. This kind of plant would be more suitable for getting biogas from the human excreta and other bio-wastes. Dung slurry and other bio-waste together with water are being prepared into a mixing tank. The slurry will be fed into the digester, which is actually a type of closed tank underground and made up of bricks. After then, the digester will be sealed from the top. The anaerobic microorganisms will decompose the biomass into the digester, producing biogas with the mixture of fuel gasses just like hydrogen, methane, hydrogen sulphide with nitrogen and carbon dioxide. Right after few days, sufficient gas is being produced and supplied into the places of use. It can also be used domestically, like cooking, heating, lighting and even with generating electricity. The slurry being left within the digester might serve as the farmer’s manure. 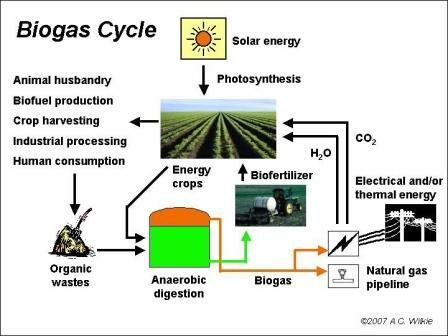 Comment on What is Biogas? can biogas compress as CNG? Yeah biogas can be compressed just like natural gas and can also be used to give power to motor vehicles. Leave a reply to What is Biogas?